your continued support is very important to me. To keep the project moving I started painting the heat tiles with Boltgun Metal last night. and the railing received paint - Scorched Brown for the supports and Boltgun Metal for the cables. As usual I will continue with all the base colors, then start the first weatehring and damage effects and give it some coats of Devlan Mud and Badab Black (or whatever the names of the new washes are). starting with Atreides127 here and others in the forums, many of you raised concern about the planned paint scheme. Thanks for this very important and valuable input! 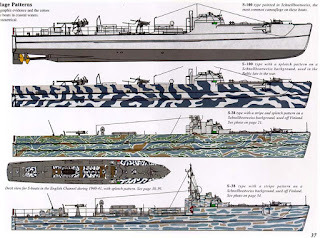 So I sent several hours yesterday afternoon (lazy day at work, but PSSST don't tell my boss) google'ing and researching camo and paint options, like these historical Schnellboot patterns. But I have to admit, nothing was really convincing. Even a suggested (by SDKFZ) Space Shuttle black and white or some urban camo, didn't fit the situation. After all, these 10 boats are specially crafted for this operation, built to navigate the lava and strike at the underground port facility. and the HERCULES on the lava board. The idea is to paint the forward heat tiles in Boltgun Metal, have the entire lower part of the hull be dark and blackened from the burns and soot, plus some heavy weaterhing, and add some reflected shine from the lava in the lower area. IF I can pull this off, together with the relative darkness of the scene (it is underground), the light effects from the gun fire and the shine from the lava, THEN I think this will work. Bridge and superstructure were next. and the inner stripes with Mahagony. Again, thanks for your feedback and suggestions! This helps me to get better. Since the last update I completed all characters, like the two Sappers hauling the demo charge. or the two Ork causalities. Then I poured another round of GW Water Effect (and crossed my fingers that everything was tight this time). While the Water Effect cured, I did a lot of Greenstuff to fill gaps and smooth en transitions. And I added connecting hoses between the re-breathers and the air-filters. I started with the base for painting. The stones received a dirty, rotten greenish grey, the piping area some dirty, dark rusty color and the lava was based with a dark red. (I've described the lava painting in the "HERCULES" as well as the "ORKALYPSE" posts in more detail). I think I will start with the boat next. Since it isn't on sea, but rather underground and on lava I plan an giving it the standard Dencara Tiger Flash pattern. sorry for the long silence, but the last week went by in a frenzy. I got so much done, that I'm sure some of you will accuse me of witchcraft, elven slavery, magic or the like. But really the model almost built itself. I worked completely without plans, really building on the fly, simply working off some reference photos of a German Schnellboot S-100. When Port Corinth was captured by the Orks of the Stachelnschweinz Clan over one-and-a-half Centuries ago it wasn't of great concern to the High Council of Dencara. At that time Port Corinth was an already aged underground mining facility located at one of the major lava streams that traversed most of Dencara. The power plant, utilizing the heat of the lava was never really state of the art, but sufficient to power the entire underground facility. The ores and precious earths mined at Corinth were precious, however the loss of the facility was more of a mercantile nature. Over the last decade Imperial forces on Dencara encountered more and more Ork vehicles and aircraft that used new and very effective alloys as well as new armor piercing ammunition's. The Dencaran intelligence service has identified Port Corinth as point of origin for these new ammunition's and alloys, where the new Mek of the Stachelnschweinz seems to make very good use of the power plant and the mining and processing facilities. To remedy this situation Operation BLACKOUT will target the power plant as well as most of the mining and processing facilities of Port Corinth. Participating forces in this operation will be the 1st Fast Attack Craft Flotilla, 272nd Combat Engineer Battalion and the 11th Infantry Battalion. The attack will be delivered via the 10 special THALASSA attack boats that will travel up the Xantha Prime lava stream to the northern entrance shipping docks of Corinth. There the forces will split up and each boat will deliver a team of sappers from the 272nd that will position demolition charges at their assigned targets while the boats and troopers from the 11th will provide covering fire. Once all demo charges are positioned all teams will retreat to their assigned boats and move to a safety perimeter awaiting the explosion of the charges. While in the safety perimeter the boats will provide covering fire with their heavy stubbers and MEDUSA gun turrets to ensure no Ork will be able to disarm the charges. After the successful raid the flotilla will head back to Xanthium. The diorama itself will show a team of sappers carrying a heavy charge, while the THALASSA attack boat and troopers provide covering fire. As mentioned above I used a German S-100 Schnellboat as reference. I had a nice sheet of wood (that perfectly fits the DETOLF cabinet) as base, which also determined the size of the THALASSA. I created a crude plan based on the available space. For the port facility itself I wanted to use my true and tried HirstArts bricks. Styrofoam for the base - on the right you can see the area that will have some machinery, while on the left will be some steps leading up to the dock. as well as the upper decks. Fits really snug onto the base. The upper forward deck will have a little bunker from where the heavy stubber can be fired. Next I started the bridge area. Especially here I used the S-100 as reference. A boat that can float on lava? I decided rather early that it will have heat tiles to protect it from the lava. Initially I planned to use hexagons, but that was too much work, so I rather went with a diamond shape instead. It looks pretty good I think. Since the bridge was a bit too low for my liking I decided to raise it a little. Since it will be partially open, I started to add details, like an observation platform and doors. The rear deck will accompany the turret for the MEDUSA gun turret, a launcher for water bombs (or mines) as well as the access to the lower decks. For this I cut some slots into the deck into which the rear section can easily be fitted. After the build-up of the sides. The forward deck with the stubber nest and the torpedo launcher. A view from above along the dock. With the MEDUSA gun turret. Here you can also see the steps to the observation platform on the rear deck. One of the final tasks was to add guardrails. Everything is detachable for painting. With the THALASSA completed I switched my attention to the dock area. Here you can see the "orkified" piping. Some crates and boxes complete the dock area. To provide some good lava I positioned several bubbles (Greenstuff balls cut in half) and then filled the area with GW Water Effect. While the base is now waiting for the initial Water effect to cure I began to work on the troopers. Here you can see the troopers figthing on the steps to the dock. One trooper is down and being dragged to safety by a fellow trooper while the other two provide covering fire. 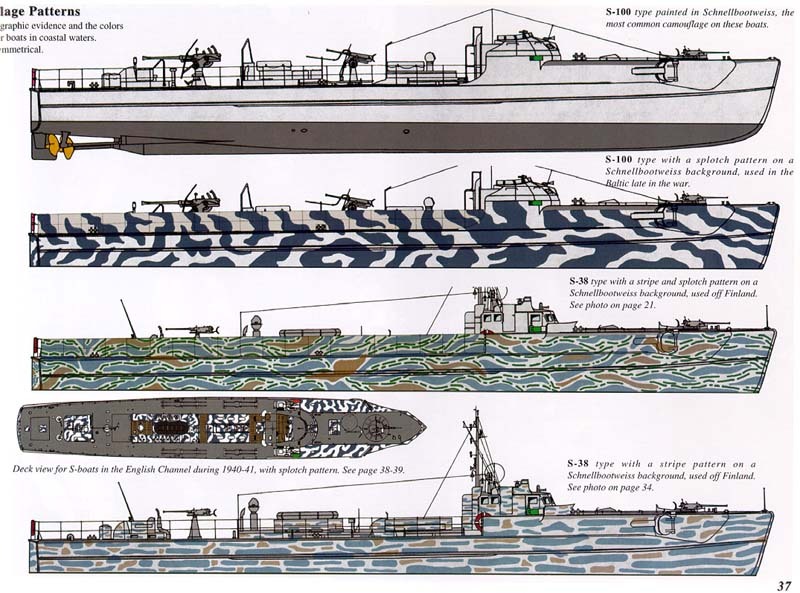 A sniper also provides additional firepower from the THALASSA. Viewed from the dock area. And finally one of the Orks that are firing back (sorry he's really dark and hard to spot). Well, that's as far as I got within the week. Now I still have to do the two sappers carrying the demo charge, a lot of cleanup and greenstuffing, as well as a second attempt with the Water Effect for the lava.